This Friday, Nov. 10 will be the opening night of the GC Theater Department’s fall mainstage show, “Crimes of the Heart” by Beth Henley. The setting is 1974, Hazlehurst, Mississippi. Three sisters, Babe, Meg and Lenny Magrath, are reunited after the youngest is accused of attempted murder. Though the plot centers on the consequences of the accusation, “[this play] is less about crimes and more about heart,” said director Doug Liechty Caskey, head of the GC Theater Department. Each sister has to deal with her own set of hardships and must find a way to navigate complicated situations that arise in the wake of the incident. The plot thickens as the case becomes ever messier — one sister struggles with unfinished relationships from her past, and another tries to keep everything together even as she herself is on the verge of falling apart. “Crimes of the Heart” won the 1981 Pulitzer Prize for Drama and was nominated for a Tony Award. It has since been adapted into a film and a full-length novel. The entire story unfolds in one room: the kitchen of the Magrath house. People come in and out, pace, drink coffee, smoke and sit at the dining room table to talk to each other. The single room setting helps to create a sense of intimacy with the audience, as they observe the goings-on and ups and downs of a family who has suffered a good deal more than most. “Crimes of the Heart” is often described as a “tragicomedy.” It tells a serious story and covers some truly heavy subject matter, including suicide and domestic abuse. Nevertheless, it is peppered with comedic moments. The show is part of the GC Umble Center’s 40th season celebration. All year, the GC Theater Department will be featuring the work of female playwrights and composers. 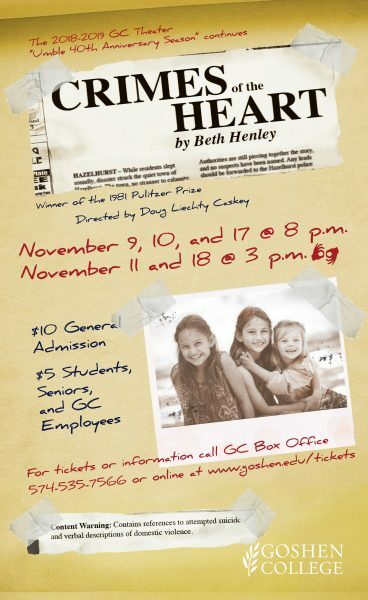 “Crimes of the Heart” is showing in the Umble Center on Nov. 10, 11, and 17 at 8:00 p.m. and Nov. 12 and 18 at 3:00 p.m. Tickets are $10 for adults, and $5 for students, seniors, and GC faculty. For tickets or information call GC Box Office at 574-535-7566 or visit www.goshen.edu/tickets. Note: This show contains references to suicide and verbal descriptions of domestic abuse. Viewer discretion is advised.